The US has agreed for the first time to help towards cleaning up a site in Vietnam which stored Agent Orange and other chemicals during the Vietnam war. Washington has pledged $400,000 (£205,000) towards a $1m study into the removal of the highly toxic chemical dioxin at a former US base at Da Nang. The move is an important step forward in a long-standing dispute between the former enemies, correspondents say. Vietnam says the chemicals are to blame for millions of cases of ill health. Dioxin is an ingredient in Agent Orange, a herbicide US forces sprayed to destroy vegetation and help them fight in forest areas during the war. Its legacy continues to damage both the environment and relations between the two governments, the BBC's Bill Hayton in Hanoi says. For several years they have been unable to agree how to resolve the issue. But now the US has agreed for the first time to contribute to a study to remove the chemical dioxin from the soil at the former base in Da Nang, which is now the city's international airport. 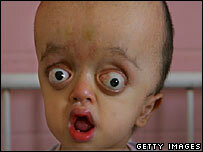 The Vietnamese government and the US non-profit Ford Foundation will make up the rest of the funding for the study. US Ambassador Michael Marine said the two countries were "not in total agreement" on the issue of Agent Orange, but he said they were working on a resolution. "What we want to do is have a success in Da Nang and then move forward from there," he said. Le Ke Son, the official in charge of Vietnam's Agent Orange research programme, described the US grant as a "meaningful action", but he admitted: "We still have a long way ahead." 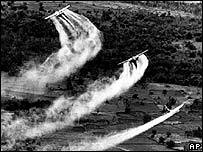 Vietnam - along with many veterans of the fighting in the US and other countries - believes four million cases of ill health and disability are linked to the spraying. The US admits that dioxin is dangerous when it is taken into the body - for example by eating fish which live in contaminated lakes - but disputes the link between the spraying of the chemical from the air and ill health.